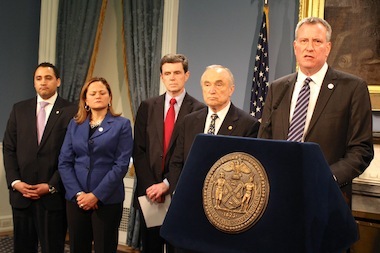 Con Edison CEO John McAvoy, center, stands with Mayor Bill de Blasio on Mary 13, 2013 during an update on the gas explosion in East Harlem. CIVIC CENTER — Con Ed and city officials continued to defend their actions ahead of Wednesday’s gas explosion in East Harlem, saying that despite anecdotal reports of a longtime lingering smell of gas, there were no reports of gas leaks in the month before the blast. In addition, they said, the caller who alerted them to the smell of gas at 9:13 a.m. Wednesday — just minutes before Wednesday's explosion — admitted he'd smelled gas the night before but failed to call to alert officials about it. "The individual said that he had smelled gas the night before. Now he didn’t call the night before, but he included that in the conversation when he reported the call at 9:13, thereby indicating the leak had likely started well before the 9:13 call," Con Ed CEO John McAvoy told reporters Thursday. Logs from the past 30 days showed no calls to Con Ed about gas leaks, and logs from the past three years only showed two reports — one in May 2013 and another in 2011, McAvoy said. The FDNY also checked its logs for the past 30 days and found no complaints, officials said. As a result, he said, the company had no information that would have helped them escalate their response. “A single person calling in to say they smell gas outside of a building is not something that would warrant a fire department response based on our current criteria,” he said. De Blasio added Thursday that all New Yorkers should call Con Ed the minute they smell gas, whether they think it's an emergency or not. "I want to strongly encourage – if there’s something that we need to remind ourselves of at this moment, it’s that if you smell gas, any hour, any day, even for five minutes, report it to Con Ed or report it to 311 so that appropriate action can be taken," Blasio told reporters Thursday, adding that there "Should be no hesitation in reporting. It is so much better to report the possibility even of a gas leak … than to hesitate." The number of calls of gas leaks doubled in the day after the explosion, NYPD Commissioner Bill Bratton said Thursday. Had there been more than one phone call complaining about the smell of gas, McAvoy said Con Ed would have sent the complaints directly to the fire department, rather than handling it in-house, as they did Wednesday. Among the factors that escalate gas calls to emergency status are secondary problems, such as the smell of gas and an electrical problem like flickering lights. Under those circumstances the fire department is immediately notified, McAvoy said. McAvoy said “there’s a very high likelihood” that the disaster could have been prevented if Con Ed had been alerted sooner.